Heat a large frying pan over a low heat. Add 50g shelled, natural pecans and toast for around 5 minutes. Remove the nuts from the pan and bring it up to a high heat. Add 1 tbsp olive oil and 70g cubed pancetta and fry for 2–3 minutes, stirring until golden and crisp. Add 2 peeled, thinly sliced garlic cloves and ½ chopped, deseeded red chilli and after 30 seconds to 1 minute, when the garlic has become golden, tip 200g curly kale into the pan and season with salt. 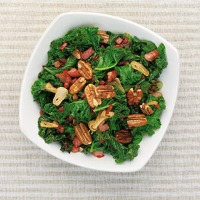 Stir-fry for 3–4 minutes until the kale has wilted and is just tender, then toss in the toasted pecans.